Charles Fort, author and investigator of the odd, speculated that there was a species of nearly transparent jellyfish that float in the upper atmosphere. Over the years, pilots have reported seeing odd shaped objects in the sky they thought resembled jellyfish. And people have found large numbers of dead birds with burn marks on them, which they believed could be caused by jellyfish stings. It begs the question, “If these creatures exist, then why aren’t there more sightings?” People who believe in sky jellyfish suggest they might have the ability to change color and blend in with the background of the sky, like an octopus. Most people still want more proof, which might be found in Oakville, Washington. Oakville is a little town located along US Highway 12, between Elma and Rochester. Today, about 1000 people live there, and it is known for being the site of both an annual Zucchini festival and the last horseback bank robbery in Washington State. But it was a strange rain that made Oakville famous for a few weeks in August 1994. That month, the strange rain fell twice. On August 7th, Sunny Barcklift looked out through the rain at the black asphalt roof of a small shed on her property. She noticed it was covered with several globules about the size of a grain of rice. When she and others picked up some of the globs, they saw they were clear and had a jelly-like texture. Shortly after handling the material, however, Barcklift and two other people went to the hospital, suffering from fatigue and nausea. A few days later, a kitten that had lived outside of Barcklift’s home died of a strange intestinal problem. On August 16, another rainstorm brought more of the gelatinous blobs to Oakville. The National Weather Service received a phone call from an unidentified man, who claimed hot metal fragments rained down from the sky, burning a hole through his children’s outside trampoline. Fortunately, no one became ill.
A local doctor doubted the strange material caused any human illness, and suggested the kitten drank some antifreeze, which killed it. All the same, he had a lab examine samples of the blobs. The initial analysis suggested they contained many different substances, including human white blood cells. The doctor thought they could have come from the waste fluid on an airplane toilet, which could explain the human cells as well as the antifreeze. However, airplane waste fluid is blue: the blobs were clear or white. Health authorities had a second analysis done, and this time, the lab reversed the initial finding of human white blood cells. Although there were living cells in the blobs, they had no nuclei as human cells do. That left investigators with an unidentified living material falling out of the sky. Someone suggested a different biological source. In early August, the U.S. Air Force conducted a series of live bombing exercises off the coast of Washington. Someone (no one seems to know who) suggested bombs had exploded in the middle of schools of jellyfish, blowing them into bits and launching the fragments into the atmosphere. These pieces were small enough to float along in the clouds until they came down in rainstorms. It was also around this time that large numbers of dead crabs were found along the Washington coast, surrounded by small globs of jellyfish-like material. The couple who reported the dead crabs became ill after handling the material. But for this to be related to the Oakville globs, the material would had to have floated for nearly two weeks, over a distance of 70 miles, from the bombing range to Oakville. Conspiracy theorists suggest some form of germ warfare. In 1997, the show Unsolved Mysteries featured the Oakville rain. They interviewed several residents who had experienced the strange rain three years earlier. 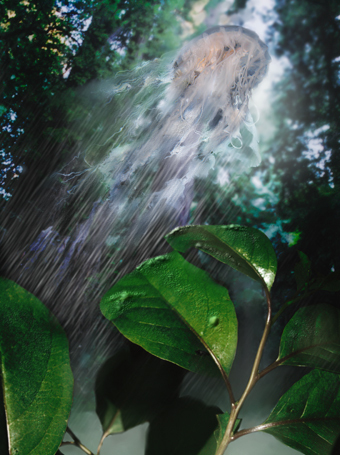 They reported the strange rain fell six times (not just two), and scientists found two different kinds of bacteria in the blobs. Several residents mentioned seeing black helicopters flying over the area at the time. Host Robert Stack stopped short of suggesting the United States government deliberately sent helicopters to leave contrails of toxic jelly blobs on Oakville. Later in 1997, the city of Everett also had a mysterious rain of gelatinous blobs. Were these the same as those that fell on Oakville, and could they be explained away as bomb testing or germ warfare conspiracies? 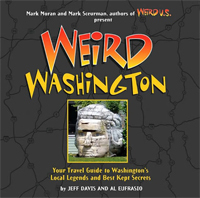 We at Weird Washington personally like the idea of flying jellyfish, perhaps going through some kind of spawning high up in the earth’s atmosphere.